Having no yard doesn’t rule out having a garden. You just have to be creative with the outdoor space you do have and, for many apartment dwellers, that’s a balcony. So how can you use every last bit of space on your balcony to create a garden sanctuary? Firstly, you need to know the weather conditions specific to your balcony. Work out what kind of light your space gets, and for how many hours each day, according to the season. Is it exposed to the wind or sheltered? Does it get full sun during the day, or is it always in shade? All these factors will determine your choice of plants. Ask for help in choosing plants at your local garden centre. They know which plants will thrive in your particular conditions. Consider a mix of annuals (for seasonal colour) and perennials (for green during the winter months) along with some seasonal herbs for a true kitchen garden. This is where you can really have some fun. 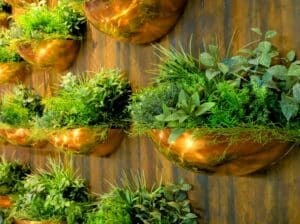 Because you don’t have the luxury of planting in the ground, you can make up for it by choosing unusual and striking planters and pots to turn your balcony into a creative haven. Put some thought into the planters you choose and make your balcony unique. Always choose your furniture first, if you don’t have it already. You might think you have a large space to fill. With table and chairs in place, however, it quickly shrinks. Work your planters and greenery around the furniture to make sure everything works in harmony. Recycle old furniture too – a bookshelf can make a great pot stand. Don’t just place your pots on the floor. Install trellis against walls and grow beautiful climbers. Consider wall shelves which cleverly house an array of pots at different levels. Vertical planting can be a great way of increasing privacy and screening out unsavoury views, as well as maximising your available space. Use your imagination. Buy pots of differing width and height to create a staggered effect. Install window boxes on your railings, hook hanging baskets on the ceiling and trail cascading plants from the wall. Water your plants frequently, especially in the warmer months. Plants in pots dry out more quickly than those in the ground, and they need that little extra love and care. Consider a shade sail to protect plants and screen sections of your balcony. At every stage of building your balcony garden, consider how it will look from inside your apartment. Don’t let shade sails, bushy plants and heavy furniture block your light or spoil your view. So why not get started? Consult your strata management if you have any concerns about regulations, and start creating a garden which will add value to both your property and quality of life.